Fue Lee, center, stands with volunteers and supporters in north Minneapolis. At 25, he's won his bid to represent Minnesota's district 59A in the state legislature. In Donald Trump’s first 100 days, he has promised to address immigration and take many other steps that directly affect the lives of foreign-born people in the US. It’s not a small population who may be affected: There are 42 million people in the US who were born abroad. Almost half have become US citizens. We’re discussing and debating Trump's plans in the Global Nation Exchange on Facebook, but it begs the question: Are there people who have experience going through the US immigration system who will be debating these plans in Washington? About 13 percent of the US population was born abroad. Just 1 percent (six members) of the current 114th Congress is foreign-born. There will be at least two new immigrant members when Congress re-convenes in 2017. Although the representation of immigrants will increase, it remains lower than historic levels, according to a 2015 Pew Research Center Report. At more local levels, estimates of representation of foreign-born citizens don’t appear to improve. A report from January by the New American Leaders Project, a nonpartisan organization that supports immigrants seeking elected office, indicates state legislatures might also not be representing new Americans proportionate to their population. The report finds that fewer than 6 percent of state legislators are of Asian or Latino ethnicity. Immigrants from Asia and Latin America make up the majority of the foreign-born population of the US. Lee, now 25, moved with his family from a Thai refugee camp to north Minneapolis in 1992. Lee says he became a candidate because he wanted to change the politics affecting north Minneapolis. 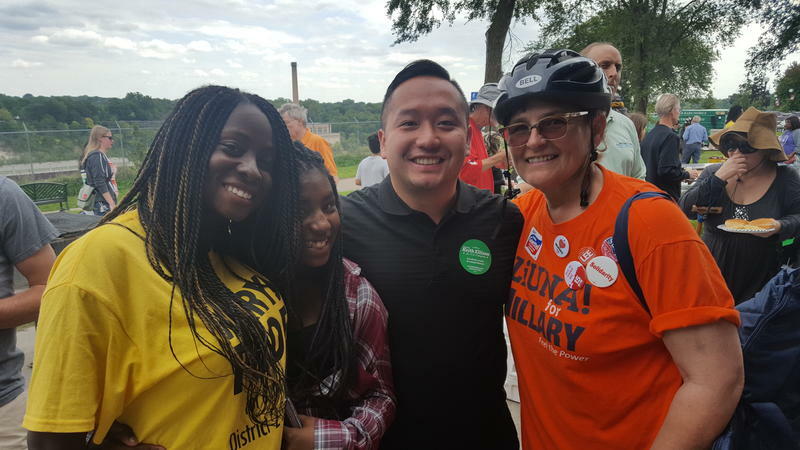 Fresh out of Carleton College, he campaigned for council member Blong Yang, who became the first Hmong American (also an immigrant from a Thai refugee camp) elected to the Minneapolis City Council in 2014. To be on the ballot for Minnesota state government, you need to be 21, be a US citizen and eligible to vote, be a resident of Minnesota for at least a year and of your district for at least six months, and pay a $100 filing fee. Pious Ali, born in Ghana, is likely the first African-born and Muslim to win public office in Portland. He won a school board seat in 2013 and this year he won a seat on the City Council. llhan Omar, the first Somali American lawmaker elected to any office in the US, will represent District 60B in the Minnesota state house. She ran against another Somali immigrant, Mohamud Noor, in the Democratic primary. Juana Matias won her campaign to represent Massachusett’s 16th district in the state house. Matias moved to the US with her family from the Dominican Republic in the 1980s. Yuh-Line Nous, the first Asian American elected to represent lower Manhattan in the state assembly, came to the US from Taiwan as an infant. Connecticut State Senator Tony Hwang, who was born in Taiwan and came to the US with his family as a child, was re-elected to his seat in the 28th district. Adriano Espaillat won his campaign to represent New York’s 13th Congressional District — and also became the first formerly undocumented immigrant in the US Congress. He was born in the Dominican Republic. Parmila Jayapal, born and raised in different parts of Asia, became one of Washington’s US Representatives after serving in the Washington State Senate. She is the first Indian American woman elected to Congress. Raul Ruiz, born in Mexico, won a third term to represent California’s 36th Congressional District in the US Congress. Legislatures should reflect the diversity of the constituents they represent, says Lee. “We're seeing more foreigners running for offices at different levels and it’s very promising for us, because we are participating in the American society,” he says. We’re talking about immigrants and politics in the Global Nation Exchange over the next few months, as newly elected officials prepare to take office. Have thoughts or ideas about how immigrants should or shouldn’t engage in civic life? Join us.